Full-back Dan Evans has agreed a new contract extension with Ospreys. 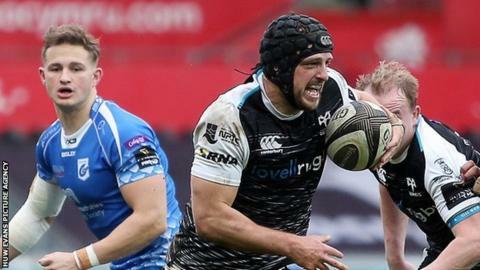 The announcement comes two days after Evans, 30, scored four tries against Dragons to become Ospreys' second-highest try-scorer of all time with 40. Only Shane Williams has crossed more times for the Swansea region, with the full-back overtaking internationals Tommy Bowe, Nikki Walker and Rhys Webb. "I'm delighted to sign a new deal and excited about what the future holds" said Evans. Evans, who has two Wales caps, is the third Ospreys signing in a week after Cory Allen and Luke Morgan. This followed a period of uncertainly when the region were close to a merger with Scarlets. "It's been a tough old season where you are not just thinking about games you are thinking about your future," added Evans, whose current contract ends in May. "It's been tough for everyone in the squad but now we can move on and hopefully build for an exciting end to the season." Evans has made 134 appearances since joining from Dragons in 2014 and was the quickest reach 100 games for the region. His 31 competitive matches in the 2016-17 is also an Ospreys record. "Dan's contract extension reflects the consistency of performance he has displayed over the last five seasons for the Ospreys," said head coach Allen Clarke. "We see Dan as a valuable player for us over the next couple of seasons."